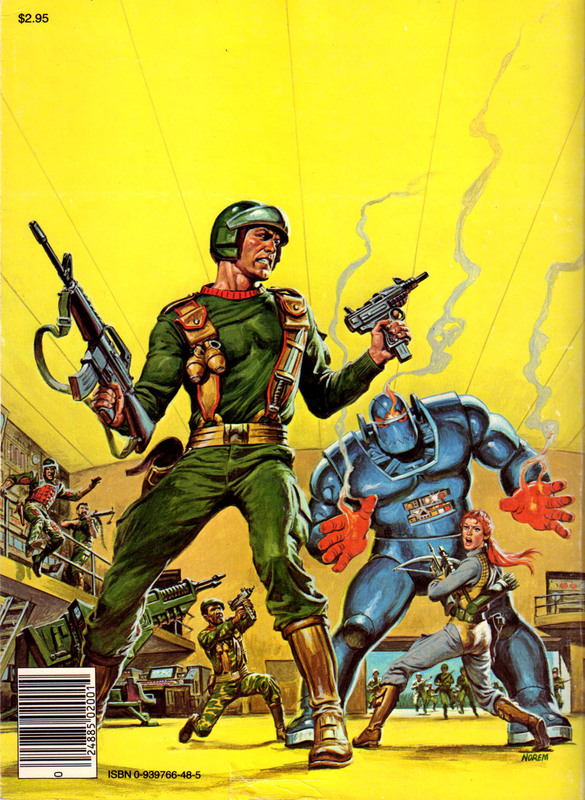 The hits just keep coming from Earl Norem with this Marvel Storybook cover. Fans of the early issues of the comic will recognize the subject matter here. The Trojan Gambit was the final issue reprinted in this collection, and I can’t think of more dynamic Joe art produced outside of the main line figure packages. Absolutely brilliant work. This type of stuff reminds of the painted packaging artwork from the 12″ Joe items. The style’s a nice connection to the predecessor material. (And may have also been a means to get Dads who played with the originals to pass on the new ones to their sons. A classic cover for sure! That blue monster looks like a Masters Of The Universe figure. It brings back some memories. Speaking of that, the 1980’s Spanish language version of the Masters Of The Universe cartoons, had some guy singing some lyrics in Spanish over the intro song. It’s too bad that the original U.S. version didn’t have lyrics on the intro song. By the way, why do some, or all of these Joes have on gun holsters? Scarlett’s legs and sleeves are baggy, like she seems to be wearing a leotard over coveralls. It’s amusing that and she and Hawk (guess that’s him in the foreground) weren’t involved in the action in the issue. But Snake-Eyes was and isn’t shown. Ah, the days before Snake-Eyes was everywhere.